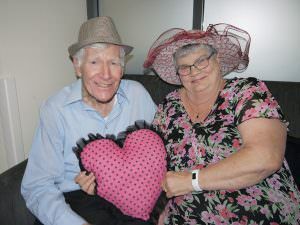 The residents of our wonderful Albury & District community got right in the spirit of Valentine’s Day this year, dressing up for high tea in fancy hats and enjoying some romantic music courtesy of our musician, John Brett. Everywhere we looked, there were people singing and tapping their toes! 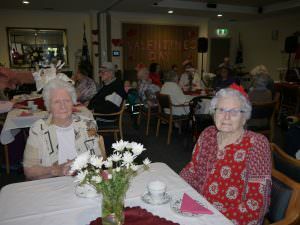 A big thank you goes to our catering and lifestyle staff, who put on a delicious menu and helped decorate the room with beautiful flowers and fine china, and to the TAFE students who were on-hand as our waiters for the day. 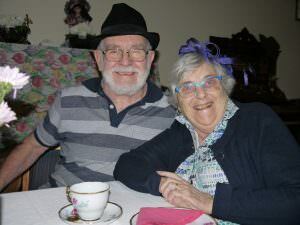 It was a special day for all involved, especially residents Peter and Marj (below left), who have been married for 60 years – you can still notice the sparkle in their eyes when they see each other!